Who wants to get absolutely filthy, conquer a few dozen obstacles and run a total of twelve miles in wet socks? Now who wants to do it at altitude while competing with thousands of others? 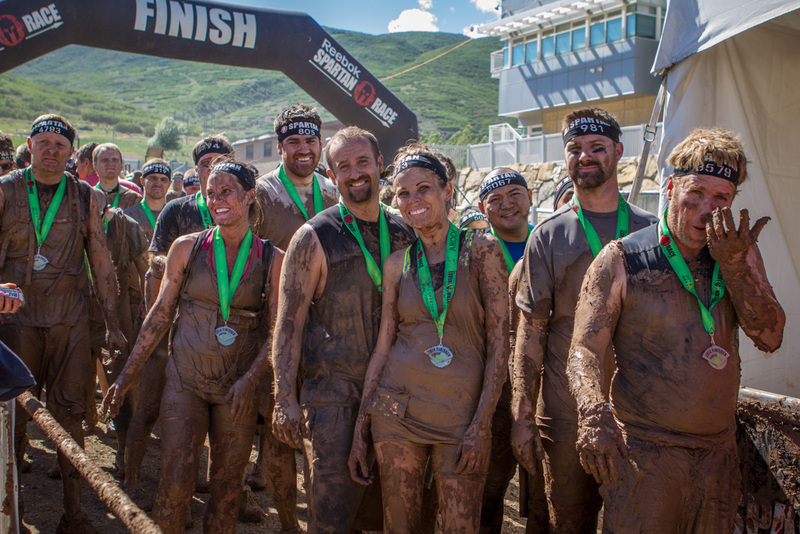 Ryan, my brother, and some friends recently completed the Spartan Beast at Soldier Hill in the mountains of Utah. The six of them paid for the privilege of going through this grueling form of torture, and for some of them it was even a repeat experience. I tagged along to see what it was all about and managed to take a few pictures along the way. 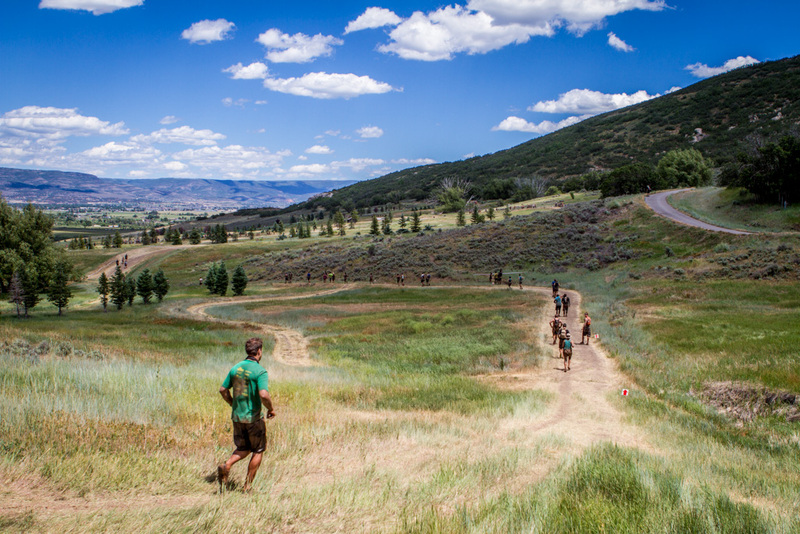 Soldier’s Hollow was a beautiful spot to hold Utah’s Spartan Beast. 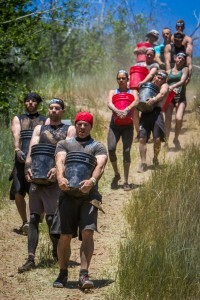 The first Spartan race was held in Williston, Vermont at the Catamount Outdoor Center in 2010. There were about 15-20 obstacles and about 500 people participated. The world championship is still held in Vermont and is one of the most anticipated races of the year. 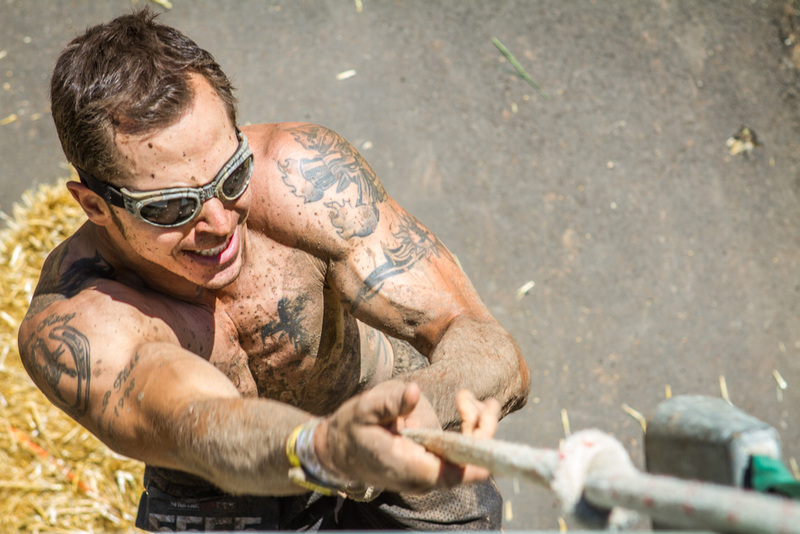 Spartan Race has become one of the biggest race brands in the country with over 65 Spartan races being hosted worldwide in 2014. Spartan races vary in length from 3+ miles (the Spartan Sprint) to 26+ miles (the Ultra Beast) with the Super Spartan (8+ miles) and the Spartan Beast (12+ miles) falling in the middle. No matter what length you run or where you place, you earn a medal just for completing the race. You can even earn a Trifecta medal by completing a Spring, Super and Beast in a single calendar year. 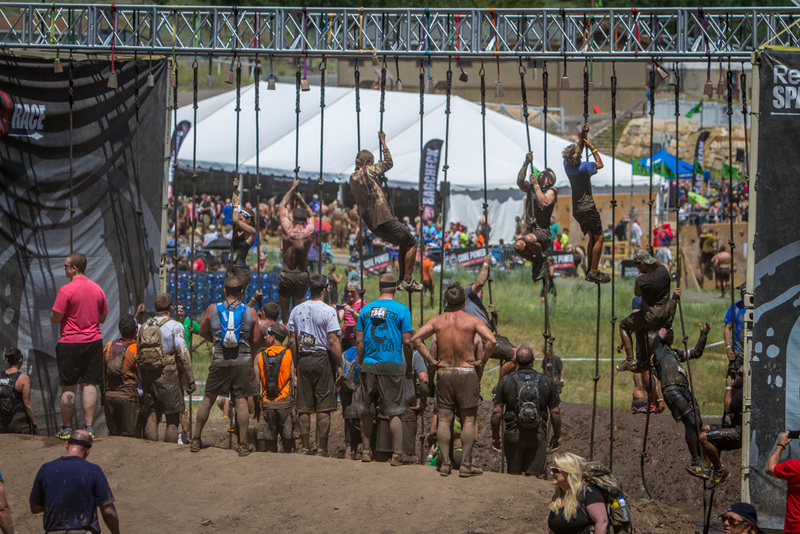 The rope climb is considered the hardest obstacle to complete at a Spartan event. An estimated one-third of participants travel in from outside the area, with more making the trek out to Vermont for the championships. 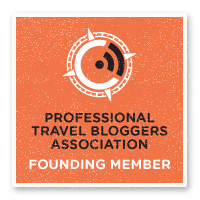 The Trifecta weekend in Hawaii also draws in a larger percentage of travelers. Obstacles include multiple wall climbs, mud crawls under barbed wire, pushes, pulls, hoists and even a spear throw. The hardest obstacle for most tends to be the rope climb, which there were two of at the recent Beast. The Spartan Beast at Soldier Hollow that my brother just ran attracted an estimated 6,700 people. 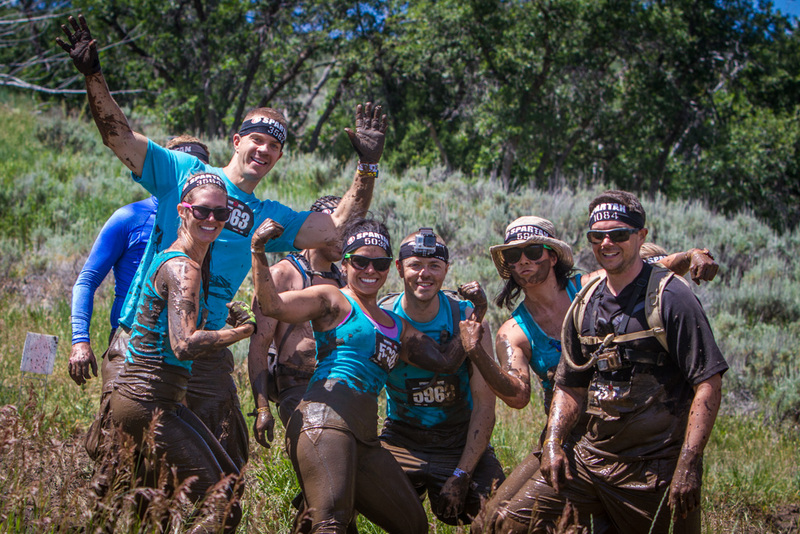 90% of them completed a total of 29 obstacles and covered just over 12 miles, including 6,000 feet of elevation. 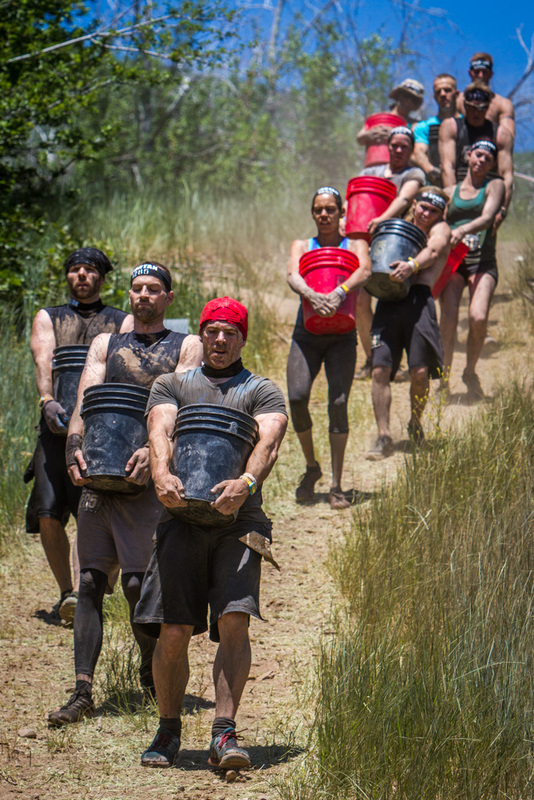 Spartan’s bucket carry involves filling a bucket with rocks and carrying it up a hill and back. The winner of the day was an elite athlete who finished the entire course in an hour and forty-one minutes. To put that in perspective, it took my brother’s group a about six-and-a-half hours to finish. After watching Ryan and friends complete the race, I can sort of see the appeal. Who wouldn’t want to act like a big kid and complete all those obstacles? Other parts, however, I’m not sure I’d be able to get over, such as running almost half a marathon in wet socks. Have you ever run in one of these kinds of races? 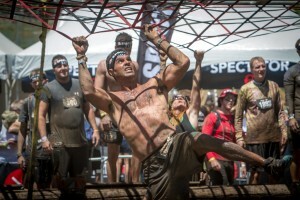 Would you sign up for a Spartan Event? In Ryan’s group there were three couples that ran the race. Ryan and Maria, Jason and Jinyi, and Rachael and Mike. This was Ryan’s X race but Maria’s first. Jason and Jinyi had done one race before, a “sprint” in Malibu last year. This was also Rachael’s first time doing any kind of Spartan race while her husband, Mike, had previously completed two beasts. 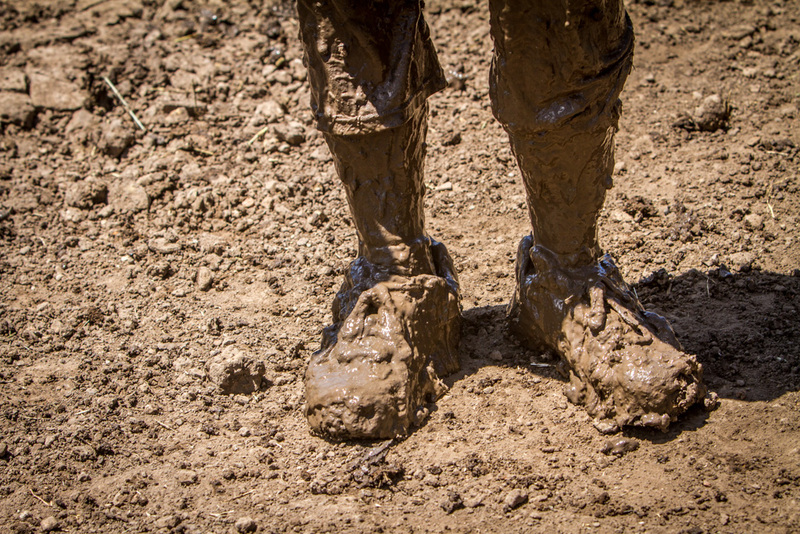 One competitor’s shoes after exiting one of the muddy obstacles. 1) Why do you do Spartan? The cargo net obstacle was done over one of the muddier pits of the whole course. The tire pull obstacle involves dragging a tire until the rope is taught and then dragging it back to the start. When you can’t complete an obstacle during a Spartan race, you have to compensate by completing 30 Burpees (pushup + jump = 1 burpee). 3) What is the hardest obstacle for you? 4) Would you ever travel to Vermont for the Ultra Beast? 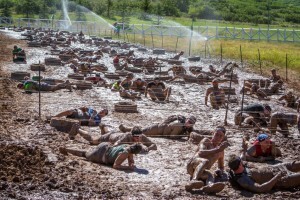 A long mud crawl under barbed wire is the last major obstacle of most Spartan races. 5) What else along these lines do you want to do? 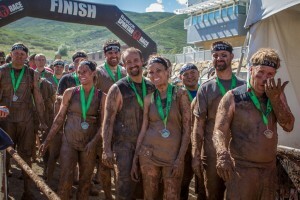 Spartan participants after finishing the 12 mile ordeal. 6) what’s your favorite and least favorite part/aspect of the race? An hour and 41 minutes? Holy cow! I have to say I’d thought perhaps I would be up for something like this until you mention the soggy socks. There’s just nothing worse than mud squelching between toes!! Hat’s off to all the crew, well done guys! See, that’s what I’m saying! 6-7 hours in wet socks doesn’t seem like something I’d want to sign up for, but who knows. Maybe he’ll convince me to do it with him at some point. Bah! I’m sure if you had a few friends going they might convince you to do it with them. Yeah, everything went very smoothly. How was warrior dash? This loks awesome. There is a similar competition in the UK called Tough Guy. I have been to much of a chicken so far to take part though. I want to go for it at some point just to complete it, but probably not anytime too soon. What’s tough guy like? This sounds like…torture! Lol! I can’t imagine myself doing something like this, but it does seem that the participants really enjoy it. Maybe if I were in tip top shape I’d feel differently, but somehow I doubt it! I think this is actually one of the motivating reasons to get in tip top shape :) At least, this is what I saw happen with some of the participants pre-race. Thanks for the comment Alysia! Fantastic. I just saw a commercial for a race coming up that NBC Sports will be showing on cable. Love this! They’re showing a full Spartan? Do you know when and which one?